New York is the largest city in the U.S., and one of the most exciting, fast-paced, diverse and expensive cities in the world. If you only have one day, skip the major museums and travel through Downtown and Midtown New York. Bolt Bus and Amtrak/NJ Transit/LIRR stop at Penn Station, Mega Bus a little farther south, Greyhound Buses at Port Authority and Metro-North trains at Grand Central. This tour starts at 34th St. and 8th Ave.
Take the subway’s yellow N/Q/R/W line downtown (towards Brooklyn) to Canal Street. Buy a MetroCard with $4.50 for each person or one MetroCard with $9 ($2.25/fare). Canal Street is packed. Walk south on Broadway (traffic goes south) for 3 blocks and turn left on quiet White Street and continue to 65 Bayard Street: Chinatown Ice Cream Factory. Walk back to Mott Street, the original heart of Chinatown. Wander around the small shops, then walk north on Mott back to Canal. Walk left for a block and turn right onto Mulberry Street. Mulberry Street is the traditional heart of the rapidly shrinking Little Italy. Eat lunch. Walk north on Mulberry and turn left on Grand Street, then right on Broadway. Shop in Pearl River Mart at 477 Broadway (Grand/Broome). Continue north on Broadway, you’re in SOHO — a shopping district with clothing stores and upscale galleries. Relive your childhood in the Scholastic Store at 557 Broadway (between Spring and Prince). Keep walking north on Broadway to Houston Street, cross Houston and to your left there’s an entrance to the Silver Towers complex, designed by I.M. Pei; in the middle is a Picasso sculpture. Walk diagonally-left to Bleecker Street. In the 1960s this was Downtown’s music scene, and The Bitter End is a famous music club. Walk north on the quiet LaGuardia Place to Washington Square Park. Enjoy the buskers, street performers, chessplayers and pot dealers. You’re in Greenwich Village — the center for bohemian culture in the 1920s, the Beats in the 1950s, Hippies in the 1960s-70s and Punks in 1970s-80s…now it’s the campus for New York University. Eat dinner on MacDougal Street, Waverly Place, 8th Street or Astor Place. Hop on the subway at 6th Avenue and West 3rd or West 8th Streets. Ride the orange B/D/F/M uptown to 47th-50th Streets Rockefeller Center. On 50th Street, pass Radio City Music Hall and walk east and go inside St. Patrick’s Cathedral for a quick tour. Walk south to 47th Street — New York’s Diamond District — and then west over to Broadway. Take the orange B/D or blue A/C uptown to 59th Street-Columbus Circle. Walk quickly through the corner of Central Park, peek inside The Plaza of Eloise fame, and sit inside Columbus Circle. Walk south on Broadway to Times Square. Many New Yorkers hate Times Square, but I love the crowds, the mixing of ethnicities and languages, and the larger-than-life attitude. It may be becoming a giant Disneyfied mall, but it’s also much safer than ever before. Now that Broadway is an incredible pedestrian plaza, gaze at all of the video billboards. Take your photo while on the amazing new TKTS Staircase. BELMONT, The Bronx — Pete Nikolopoulos, the mustachioed longtime owner of Pete’s Cafe on Fordham Road in The Bronx, died of a heart attack at the age of 56 while on a business trip in Greece, reports the New York Times. Nikolopoulos was a descendant of Greek Revolution Captain Antonis Nikolopoulos, according to the Greek Reporter USA via BoogieDowner. He had come to New York in the 1970s, working as a busboy and dishwasher before buying the diner in 1978. I’ve only been in the diner once, while on assignment for the Norwood News in late summer 2008 to cover a City Council coffee with reporters. Though I didn’t eat anything, I remember walking in and seeing Pete: slick jet-black hair, wide lapels on the suit…and the mustache! I sport a much-less-impressive mustache, and was in awe of this man with the perfectly twirled ‘stache, who never left the ’70s. After the meeting, I bought the black-on-white t-shirt: the front (above) with the portrait of Pete (with the chest hair detail!) and the back that says “Go Rams Go!” for the Fordham University Rams. I proudly wore the t-shirt at the awesome Ting Tings/MGMT concert at McCarren Park Pool during the Summer of ’08: The Last of the (McCarren Park) Pool Parties. I had thought I’d beat the hipsters at their own game. Where would they have seen a retro shirt like mine? It turns out I was underdressed — where were my rubberband wristbands, aviators and mismatched Chuck Taylors? But I didn’t care. 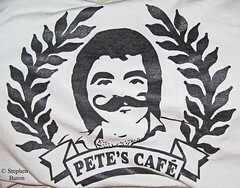 I had the Pete’s Cafe t-shirt. Those kids probably have never been to The Bronx. Saw the amazing Kazakhstani film “Tulpan” at Film Forum this week. (Update: Now on DVD.) Set in the windswept “Hunger Steppe” of southern Kazakhstan, the film follows Asa, a young man who returns home from military service with the Navy to his family of nomadic shepherds. He intends to court Tulpan, the area’s only woman who can be married. The film, shot with mostly non-professional actors and natural effects — including a 10-minute sheep birthing scene, is part ethno-drama, part coming-of-age tale. It won the 2008 Cannes Film Festival’s Prix Un Certain Regard for “original and different” work. “I asked the family to live together one month before the shooting in the yurt, him working as a shepherd, her as a mother to look after children, prepare everything and cook. That’s why you see children so natural, it’s like family. So…I knew that Kazakhstan will not be like Borat, and I don’t think Almaty will be like this, either. What will the trip be like?